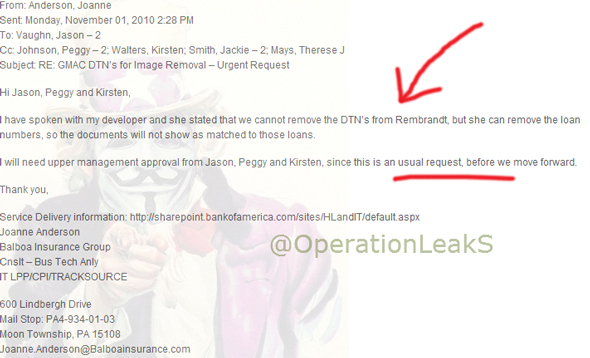 #OperationLeakS by Anonymous Hacker leaks Bank of America Emails ! OperationLeakS by Anonymous Hacker leaks Bank of America Emails ! We may soon find out whether it's possible to shame one of the big U.S. banks by exposing its mortgage missteps. A series of messages on Twitter Sunday evening promised the release of emails supposedly documenting "fraud and corruption" at Bank of America (BAC). The post, from the anonymous @OperationLeakS handle, said "leaked emails" from the bank would be posted at 5 a.m. London time, which is 1 a.m. in New York. The release will come three and a half months after Wikileaks founder Julian Assange breezily promised to "take down a bank or two" by releasing "either tens or hundreds of thousands of documents." Assange likened the documents to the ones that prosecutors used in bringing top executives of failed energy trader Enron to justice. The bank didn't immediately respond to a request for comment. The document dump, billed in the Twitter posts as "Black Monday," may well lead to a brief media frenzy -- though that is seeming less and less likely with each depressing development in Japan. In any case, Assange himself said he didn't think the leaked documents rose to the level of criminal behavior, and the banks have more or less shown that they don't really mind anything short of that. So whatever gets leaked seems distinctly unlikely to make BofA chief Brian Moynihan blush -- let alone bring down a $145 billion bank whose survival became an explicit goal of government policy during the financial meltdown. The documents apparently center on the bank's mortgage practices, which have come under fire because of BofA's spotty record on wrongful foreclosures and its high level of delinquencies. A 29-minute video that links to one of Sunday evening's Twitter posts accuses the banks of ruining the American dream by wrongfully foreclosing on homeowners. One recent tweet reads, "Balboa Insurance/Countrywide knowingly hiding foreclosure info from federal auditors during the federal takeovers of IndyMac Federal." Another reads, "Ex-Bank of America Employee Can Prove Mortgage Fraud Part 1." BofA bought giant subprime lender Countrywide in 2008. It has since spent hundreds of millions defending itself from predatory lending and other lawsuits, and tens of millions more picking up the growing legal tab of ex-Countrywide chief Angelo Mozilo. The swamp is so deep that BofA recently brought in a new executive to try to drain it. BofA and the other big banks have recently been pushing back against a settlement being pushed by the state attorneys general that would have the top U.S. lenders and mortgage servicers pay $20 billion or so to fix their faulty practices. The banks' posturing over the mortgage settlement makes it not all that hard to understand why some people would like to bring them down. In typically tone-deaf fashion, BofA – which got the second-biggest bank bailout after Citigroup (C) in the 2008-2009 financial meltdown – says its reason for opposing a big mortgage settlement tab is, get this, fairness. "There's a core problem that if you start to help certain people and don't help other people, it's going to be very hard to explain the difference," CEO Moynihan, BofA's $10 million man, said last week in a meeting with investors and analysts. "Our duty is to have a fair modification process." Time will tell what Assange & Co. have on BofA, but clearly it is going to take quite a bombshell to get the bank's attention, let alone bring it down.